The ‘173 patent describes a game where the player’s scores are calculated so as to be equally fair to beginning and experienced players. The most recent score of the player is always kept, but it replaces any score that falls outside of a prestige ranking the player has. Thus, the invention rewards a player for performing well in the current game while not punishing him for his inexperience. We have all had the problem where we are terrible until we get our feet under us during these games. This system should help because our current accomplishments can all but erase our poor starts. As beginners advance and gain more skill this invention should help them move up in the rankings and eventually gain enough skill to compete with the more advanced players. A game apparatus is disclosed that retains a player’s game score, regardless of whether the player is a skilled player or a beginner. The game apparatus performs ranking under circumstances that are fair to both skilled players and beginners. The game apparatus is premised on a fact that a most recent game score of a most recent player is always retained and, because the game apparatus is constituted so as to be fair to beginners and skilled players alike, in storing the most recent score a temporally oldest game score, having a ranking outside of a prestige ranking, is replaced by the most recent score. A ranking display in connection with the game apparatus is not biased toward the skilled player and can be enjoyed even by a beginner. 1. 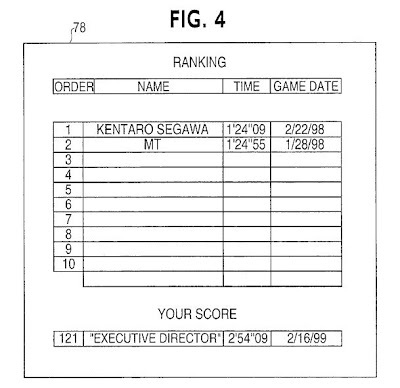 A game apparatus, comprising: game score computing means for computing a game score pursuant to game results of a player; game score storing means for storing a prescribed limited number of game scores computed using said game score computing means, wherein the prescribed limited number of game scores constitute a prescribed ranking; and substituting means for substituting a most recently completed game score for a preexisting game score regardless of whether the most recently completed game score falls within the prescribed ranking, wherein said substituting means further comprises means for determining whether said prescribed limited number of game scores is exceeded when said most recently completed game score is stored by said game score storing means, and means for replacing said preexisting game score with said most recently completed game score based on an age of said preexisting game score, provided the most recently completed game score is determined not to fall within the prescribed ranking.